Love rainbow colors? This solar powered gadget can be placed near sunlight such as window and its slowly rotating crystals will create beautiful rainbows. 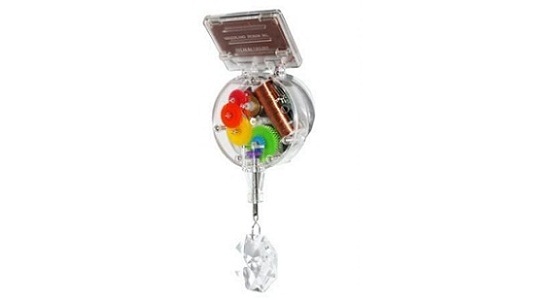 Made with Swarovski elements that cast dazzling rainbows is truly a satisfying gadget every house lover will like to have. A perfect gift for every season and any occasion. Its designed by David Dear for Kikkerland and measures 2 x 1.875 x 3.75 inches only. Just place the rainbow maker near sunlight in the house and slow rotating crystals will create stunning rainbows which will ultimately rotate around the room.